David Cameron is facing a barrage of criticism for announcing that he is only willing to appear in one TV leaders’ debate – criticism that will only increase after the broadcasters announced they would “empty chair” the PM if he did not turn up at debates scheduled throughout April. Naturally, the loudest boos have come from the opposition, which has variously called him a coward and a bully for withdrawing from a proposed head-on debate with Ed Miliband. But research from the Media Standards Trust suggests that Cameron might be wise to opt out. The Conservative party agenda is on far safer territory in national newspaper coverage than on TV. In the eight weeks of campaigning from January 5 to March 1, all the leading online national newspapers reported the Conservative Party to a greater degree than its rivals. While this prominence is most evident in the Daily Mail and Telegraph, perhaps most striking is the Conservative Party’s dominance in newspapers more traditionally associated with Labour support, including the Guardian, Mirror and Independent. 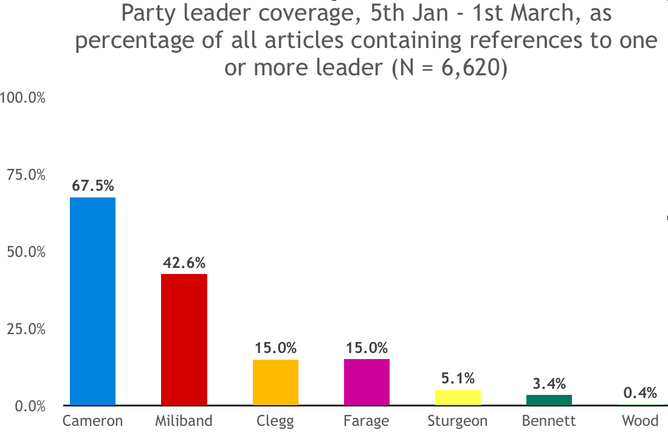 Conservative prominence in newspaper coverage extends to the reporting of party leaders, too. According to the Media Standards Trust, David Cameron has been the most visible leader since campaigning began in 2015. He has featured in over a third more articles than Miliband but has also received significantly more attention than Nick Clegg, Nigel Farage, Nicola Sturgeon, Natalie Bennett and Leanne Wood. Of course, Cameron’s appearances alone don’t necessarily advance the Tory party’s agenda. But his party also benefits from the way issues are covered. 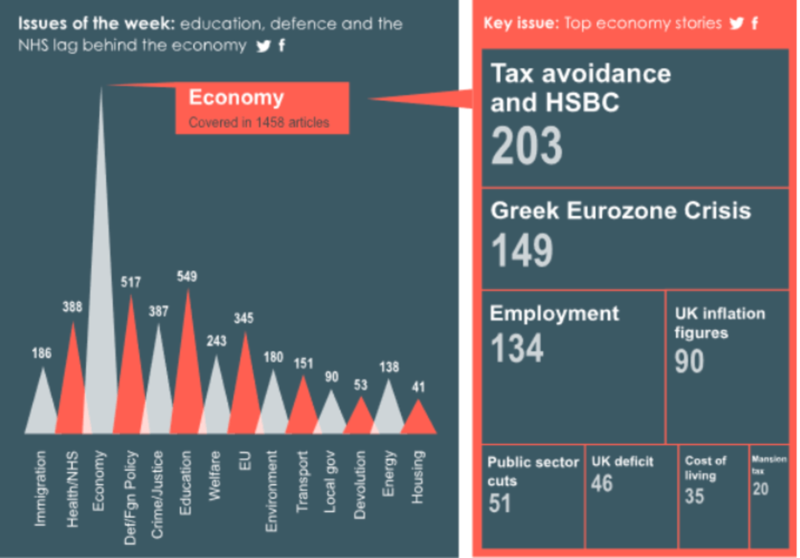 The economy has been by far the most reported topic of late. 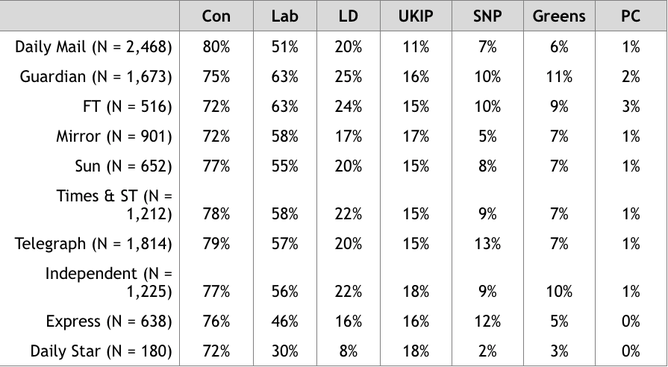 Since opinion polls repeatedly show voters trust David Cameron’s party the most with managing the economy, the attention paid to this policy plays to the Conservatives’ campaign tune. And while it would be difficult to argue that Cameron is a much-celebrated leader, even in the Conservative-supporting sections of the press, the coverage does appear to be putting him and his party in a good light. 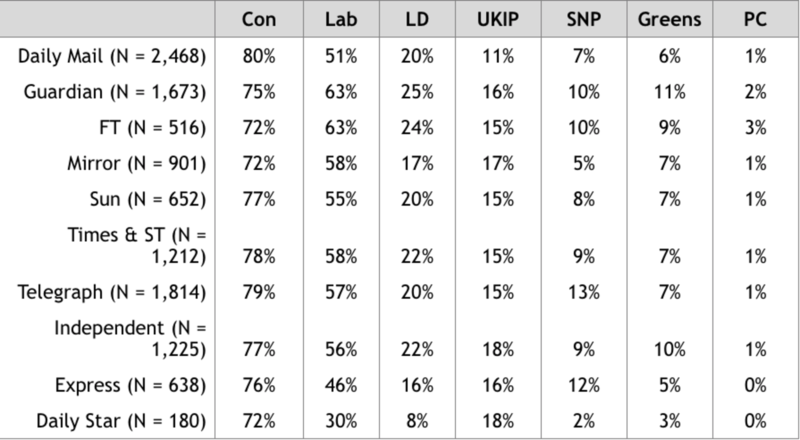 An analysis of online leader columns between February 16 and 22 suggests that, while Labour is subject to repeated criticisms, the Conservative Party receives more positive commentary than any other party. News about David Cameron’s retreat from the debates led the morning and evening TV bulletins the day after the announcement. While the Guardian, Mirror and Independent had front page splashes about the TV debates on the Friday after the Tory’s letter was sent to broadcasters, between them these Labour supporting papers sell considerably fewer than the Conservative-supporting press. By contrast, the lack of front page news about the TV debates in the bestselling newspapers – The Sun, The Daily Mail, The Express and Daily Telegraph – was conspicuous by its absence. But 48 hours later the broadcasters announced they would still stage the TV leaders’ debates and leave open the invitation to David Cameron. At this stage it remains unclear whether the debates will go ahead because “empty chairing” the PM could be open to legal challenge. Cameron now has to decide whether or not he wants to risk sharing a platform with rival parties. It’s a bold move by the broadcasters that perhaps surprised the PM’s advisers. If not for the TV leaders’ debates, the campaign might have been fought on safer Conservative territory. Gordon Neil Ramsay assisted in the analysis featured in this article.